The ambient occlusion lighting has mysteriously disappeared from Red Dead Redemption 2, but why? Red Dead Redemption 2 is a technical powerhouse of a video game, displaying acres of open world country in stunning, richly detailed 4K resolution on both PS4 and Xbox One. 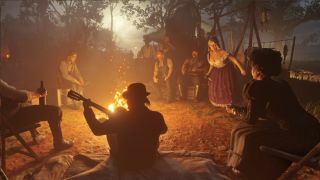 It's no doubt pushing the eighth generation consoles to their very limits this late in the generation, then, but is Rockstar trying to walk back on that ambition with a recent patch to its Wild West masterpiece? The studio has been updating the game regularly since its October 2018 release, mainly to flesh out the somewhat beleaguered Red Dead Online with fresh content in a bid to make it more profitable, but a graphics downgrade may have been snuck in at some point over the last few weeks and months. An eagle-eyed player has compared an image from a cutscene in the singelplayer portion of the game at two points in time to try and show how this may be the case. Seen below, it shows the same snapshot from the vanilla version of Red Dead Redemption 2 before it was ever patched, and another from the most recent edition of the game, 1.06 (i.e. six updates later). As you can see, the lighting between the two looks a little different, and slightly less natural in the second image than the first. Some players are pointing to this as proof that Rockstar has removed Red Dead Redemption 2's Ambient Occlusion from the game's lighting physics, a technical effect that makes shadows appear more realistic against the geometry of the environment. Rockstar has made no official statement on this change, but another player has suggested the studio's been slowly degrading Red Dead Redemption 2's lighting physics since launch, perhaps to make it at a smoother rate in both singleplayer and online. This discovery follows last week's update to Red Dead Online which added new multiplayer modes, weapons, and items to the game but, again, the patch notes showed no sign of any technical tweaks. What do you think? Is Rockstar not telling us something about its post-launch curation of Red Dead Redemption 2? Or is this all just a case of smoke and mirrors? Let us know your thoughts in the comments below. Check out our Red Dead Redemption 2 guide for every tip and trick you need to survive and thrive in Rockstar's Wild West.